Common compression spring used on flippers, pop bumper, ball kickers, ball poppers. Common spring for pinball machine ball shooter assemblies. Medium-high tension spring used on pinball machine ball shooter assemblies. 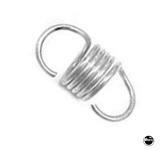 Compression spring used on pop bumper assemblies and others.